@rick.lang Yes the "incubation" period had been almost a year but we have made much progress. We were also taking our time on feedback and to plan out our cinema set. The 50 APO was announced as a FF but it actually has 8K sensor area coverage. During development, we have forecast 8K to be coming in the near future and surprisingly, there are 8K sensor options available on the market now. Due to this "incubation" period, we will now ensure the set would have lenses with 8K compatibility. The PL development began when @john brawley invited me to join his team on set in Melbourne in 2013. Everyone was very nice and shared their invaluable on-set experiences with me. Others have helped in the process, including Roger Cicala who invited me to their HQ in Memphis. A lot happened there, but the end result was a re-designed 50 APO lens that surpassed the IQ of the original prototype. I have also met Illya Friedman in Los Angeles learning about PL mount incompatibility issue with third party adapters in the process. When PL mount incompatibility issue was resolved, it was Andrew Reid that gave the final push to offer the interchangeable PL mount design we came up with. Now, we have figured how to make this PL lens to have a wider audience, allowing for normal production. High costs are involved with single unit production leading to price expectation of approximately $2K. Single unit production means we will only make a few lenses per month like our 50mm T0.95 CINE lens in M mount. As we are now able to put this project into normal manufacturing process, we are able to lower our manufacturing cost. The lens does exist, as it is currently under production and would be available for sale by the end of this year at a promotional price of $999. During this promotional period, the Titanium PL mount with capability to use third party adapters would be offered over the Aluminium PL mount only option. We can’t thank enough to everyone involved with giving us suggestions. We plan to have our APO set ranging between 25 on the wide end to 135mm on the tele end with 8K sensor area coverage. If we do offer lenses wider than 25, it would be in S35 format. John et al, thank you so much for the support and encouragement you have given to SLR Magic that has brought us to today's astonishing post from Andrew. I have replied privately to Andrew as we have been exchanging emails. I'll try not to wax poetic about this post from Andrew. I think I posted more than once that if BMD were ever considering making their own cinema lenses, they should buy SLR Magic at least brand their lenses. I said that because I was concerned that no one was bringing to the manufacture of cinema lenses the same sincere devotion to indies and professionals (those who are not working on projects with large budgets) that has characterized and motives Blackmagic Design to offer those people affordable cinema cameras. When Frank dropped his bomb a week ago Monday, it looked like Samyang/Rokinon was about to do that. And Rokinon Xeen lenses do look quite good, and tempting, but particularly for people on this forum including me, the cost of the Xeen lenses are a stretch. However I was working on my budget to pick up a set because they are the best value for a starter set of true cinema lenses. But 'affordable' is a relative term, yes, less expensive than their competitors, but more than I expected from Rokinon. And then Andrew drops his own bomb today. Like the BMCC, the BMPCC, the URSA/Mini 4.6K, all cameras that have earned a reputation for providing better image quality at less cost than anyone else appeared to think possible, I think we can look back on today as the day that we know SLR Magic is about to make their mark, as John said, to find their niche, providing indies with truly affordable lenses coupled with high image quality. Not a Master prime or Ultra prime, not a Cooke, not a Hawk, but their own lenses with character. We now anxiously await the formal unveiling of the production APO family and the SLR Magic anamorphic lenses. I feel so privileged to have been a tiny part of this revolutionary day. And I am so indebted to you all. Good thing I didn't get all emotional and poetic, right?" Thanks Rick, that is really exciting news! I'm sure it will be a couple of years before we see a set (x6?) of APO primes, but just to know that SLR Magic is entering this space is very encouraging. The 50mm has already established itself a great reputation and it's not even in the market yet! I can really see myself owning a set, especially with the potential for interchangeable mounts. Wow! The future of indie filmmaking just gets brighter and brighter. "The lens does exist, as it is currently under production and would be available for sale by the end of this year at a promotional price of $999. During this promotional period, the Titanium PL mount with capability to use third party adapters would be offered over the Aluminium PL mount only option." The interchangeable mount he had mentioned at the trade show was PL to EF only, with third-party PL adapters for other mounts such as for MFT camera mounts. We may need to wait to see the details when the lenses are formally introduced to see how this transpires, to see what SLR Magic offers and what will be via adapters. Stay tuned! A further note on the promotional pricing. The 50mm APO 8K PL mount in titanium will be $999 for a limited time. After that time the lens with an aluminum mount will also be $999. The titanium mount will still be available for professionals and rental houses but there will be a price increase to be announced later. The lens(es) are due to be announced formally in one to two months. I don't know how many lenses will be available immediately or soon thereafter, but my guess is three lenses will be released before the end of 2015 with three more to come in 2016. The final set of lenses may be greater than six, but that will likely depend upon the popularity of these lenses with indie shooters. Thanks for update Rick. The titanium mount sure is an attractive option. Tristan, it might be interesting to know the grade of aluminum alloy they'll be using. The Ciecio7 is a fairly high grade, maybe the APOs will be too. Nice comparison, how far SLR Magic has come in the last three or four years. I think this lens blows the socks off the XEEN, and will give the Veydra some stiff competition. The SLR is more compact, less distortion and no CA. Rick, what is the front ring/filter size on the SLR M 50mm? There will also be the true anamorphic lens which might, possibly confusingly, be called the Anamorphot as well since at least people will know it comes from SLR Magic and not some other manufacturer. The first Anamorphot lens will be 70mm having a 2x squeeze, with more to come. Price and release date and focal lengths and aperture have not been announced. All we know is it's a 70mm. An Anamorphot lens of course is 'easy' to focus compared to the Anamorphot adapters. The Rangefinder is supposed to make Anamorphot adapters (or any other glass) easier to focus with a 300 degree focus throw. Still I'd prefer the real thing (sorry, Pepsi). It was my intention to shoot raw 2.4:1 on the URSA Mini so the 4.6K sensor is just cropped at 4608 x 1920 to look similar to an anamorphic movie. But you won't get a true anamorphic look in camera without the real thing, shooting raw with the 4.6K sensor cropped at 3072 x 2560 (6:5). Thanks for sharing that! I've been very happy with my SLR Magic 12mm cine lens, the only actual issue so far being that it's been tough to get my wireless follow focus to cleanly mate with the built-in gear, even though the same motor has no trouble with the significantly heavier Zeiss CP.2s. I think it's either the shape or pitch of the gear, but I'm not sure yet. That's been the "bad" part. It's quite a bit more flare-prone than a CP.2, which is easy to cure with flags on a matte box (or place a PA or director in the right spot ), and the image quality has been excellent. I can't compare them directly to the Zeiss CP.2 right now, since my CP.2 set is PL and my SLR Magic 12 is MFT, so they end up on drastically different cameras, but rendered at the same resolution, I'd wager that no one would be able to tell the difference. The footage from the SLR Magic matches up quite nicely with images captured with Nikon, Sony/Zeiss, and Minolta (Leica R) glass on the same sensor though, and those are all lenses I've used for 24x36 fine art prints. That gives me high hopes for their PL mount lenses, so if I'm able, I'll grab one during the promo pricing phase. I don't know how long the promotion will last but if early reports of the production titanium 50mm APO are very positive, I think I'll get one at the introductory price... and I don't have a PL camera to put it on. Maybe I'll get an adapter to put it on my Canon Rebel XT (EF-S APS-C) camera to test. rick.lang wrote: Maybe I'll get an adapter to put it on my Canon Rebel XT (EF-S APS-C) camera to test. So we can definitely use the PL lens on an EF mount (obviously with an adapter)? The flange distance or shape of the rear element won't cause problems with an adapter (or, I should say, with third-party adapters, like the ciecio7) or, say, the mirror of a DSLR or go smashing into the sensor? lol I'm having the same thoughts about the Xeen. I think SLR Magic tested the lens on the EF to PL adapter with the Canon 5D they had at the trade show where they announced the 70mm Anamorphot lens and the Rangefinder. Something to verify with the Xeen primes. The APO lenses are engineered not to protrude like some PL lenses. SLR Magic will have their own EF camera mount to PL lens adapter so they are not recommending any third party adapters. At IBC once again they'll be showing the 50mm APO PL mount but presumably this will be the titanium mount and not the aluminum mount they introduced last September. There will not be specific formal announcements regarding the APO family of spherical primes for full frame coverage, but there will be an announcement regarding the anamorphic lens family. Recall they have shown the 70mm prototype earlier this year but that had no markings on the lens barrel. It looks like SLR Magic will be providing a lot more information in two weeks at IBC 2015. Not long to wait for that family that has received almost no attention so far. The anamorphic lenses could be exciting in several aspects. Price is unknown at this time, but you know they'll do their best to keep if affordable. But in terms of shooting with the 2x squeeze anamorphic lenses, the new 4.6K sensor's 3K window 3072 x 2560 is an ideal aspect ratio for generating 2.4:1 deliverables or DCI 4K. What makes it special is the desqueezed image has a horizontal angle of view that is quite close to 135 film with a 'crop' of 1.065x. Compared to 135 film normalized to a 2.4:1 aspect ratio (36 x 15mm), the desqueezed image loses about a millimetre off each side and the bottom of the frame (33.8 x 14.1mm). That is interesting, no? SLR Magic confirms in addition to the 50mm APO which is in production now, but not released, they are working on a 85mm and a 32mm APO. I Think there's a 25mm coming too. These would all be T2.1 with common gear positions and outside diameter of 95mm. There may be slight variations in lengths of the lens housings. "Hong Kong, China (Sept 9th, 2015) – SLR Magic is proud to announce the development of the SLR Magic ANAMORPHOT-CINE 1.33x lens set for indie filmmakers. To achieve the much loved 2.35:1 scope aspect ratio, which gives a very pleasant, epic effect, filmmakers must crop off the top and bottom of standard 16:9 footage when using spherical lenses with modern digital cameras. As a result, 25% of sensor/negative information is discarded. This 1,33x anamorphic lens help filmmakers to maximize their image quality by preventing this loss of vertical resolution. The unique 1,33x squeeze factor uses the entire 16:9 sensor/negative area to achieve the desired 2.35:1 aspect ratio. The SLR Magic ANAMORPHOT-CINE 1.33x does this by compressing a 33% wider field of view to fit the width of the 16:9 sensor/negative without compressing image height. Modern professional cinema cameras have large sensors capable of capturing an image in the 2.35:1 format directly, using spherical lenses, but film makers still desire the anamorphic “look” which often limits them to using rare vintage lenses. These present a number of difficulties in practice such as size, weight, lack of close focus, availability, and high price. We sought to overcome such issues with the SLR Magic ANAMORPHOT-CINE lenses. The SLR Magic ANAMORPHOT-CINE 1,33x create a unique “artifact” such as horizontal lens flare, commonly referred to as anamorphic streaks, and may create slightly elongated bokeh. Over the history of cinema, these same stylish effects have contributed to the cinematic “look” of epic motion picture photography. Characteristics that shape this anamorphic “look” come from “front-mounted” anamorphic designs such as the SLR Magic Anamorphot while “rear-mounted” anamorphic designs have more suppressed anamorphic characteristics. "Hong Kong, China (Sept 9th, 2015) – SLR Magic is proud to announce the SLR Magic ANAMORPHOT-CINE 2x lens set for indie filmmakers. 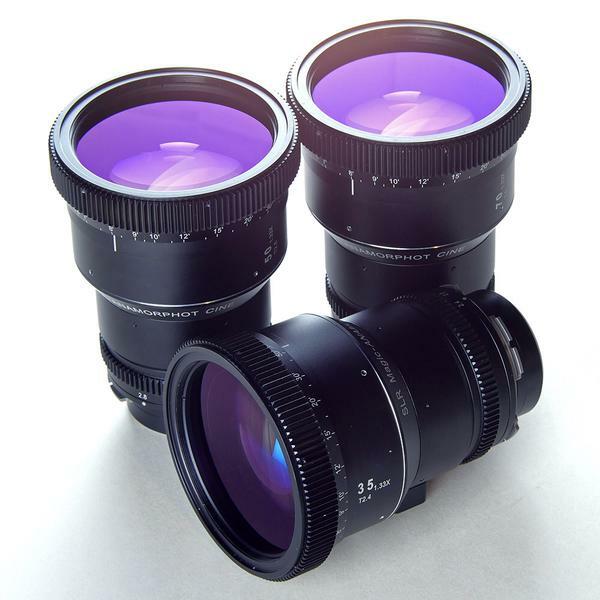 This 2x anamorphic lens help filmmakers to maximize their image quality by preventing this loss of vertical resolution. The unique 2x squeeze factor uses the entire 4:3 sensor/negative area to achieve the desired 2.66:1 aspect ratio. The SLR Magic ANAMORPHOT-CINE 2x does this by compressing a 100% wider field of view to fit the width of the 4:3 sensor/negative without compressing image height. The SLR Magic ANAMORPHOT-CINE 2x create a unique “artifact” such as horizontal lens flare, commonly referred to as anamorphic streaks, and may create slightly elongated bokeh. Over the history of cinema, these same stylish effects have contributed to the cinematic “look” of epic motion picture photography. Characteristics that shape this anamorphic “look” come from “front-mounted” anamorphic designs such as the SLR Magic Anamorphot while “rear-mounted” anamorphic designs have more suppressed anamorphic characteristics. Will there be a PL mount version of the 2x Anamorphic lens? A 1.33x lens for PL and 2x for MFT seems backwards to me. Danny, I was initially taken aback by that too. Still mulling it over. The 2x anamorphic squeeze is ideal for the URSA/Mini 4.6K sensor's 3K 6:5 window giving a 2.4:1 aspect ratio 6144 x 2560. But if you shoot open gate with the 4.6K sensor 16:9, with the 1.33x anamorphic you get 6144 x 2592 raw and can then crop top/bottom or reframe to 2.4:1 or whatever you prefer. So little to be disappointed about from the post perspective. Perhaps even the image quality will be better with a 1.33x desqueeze compared to a 2x desqueeze. But the anamorphic 'look' isn't as strong likely with 1.33x versus 2x. Will be interesting when there is footage comparing the 'look' from both sets of lenses. So perhaps premature to come to a conclusion, although I was completely surprised by the pairing of the two press releases. I'll wait and see. At this point, I am looking forward to using the APO family shooting 2.4:1 in camera more than the Anamorphot CINÉ families. rick.lang wrote: Danny, I was initially taken aback by that too. Still mulling it over. The 2x anamorphic squeeze is ideal for the URSA/Mini 4.6K sensor's 3K 6:5 window giving a 2.4:1 aspect ratio 6144 x 2560. But if you shoot open gate with the 4.6K sensor 16:9, with the 1.33x anamorphic you get 6144 x 2592 raw and can then crop top/bottom or reframe to 2.4:1 or whatever you prefer. So little to be disappointed about from the post perspective. Perhaps even the image quality will be better with a 1.33x desqueeze compared to a 2x desqueeze. But the anamorphic 'look' isn't as strong likely with 1.33x versus 2x. I've done enough anamorphic camera tests in 1.33x to have decided that I want to go with 2x. So without a 2x version of their PL mount lens, I'm reasonably certain that I can't go with SLR Magic's new line. I'm sure there are many who would really like to get a set of 2x PL lens. As it stands, I will probably end up renting some Kowa Prominar 2x PL lenses from a local equipment house. Danny, after IBC 2015, I'll pass on feedback to SLR Magic about the need for 2x Anamorphot CINÉ in PL mount. It could still happen I suppose as other feedback I've received has also backed up what you're saying. I was just trying to find the silver lining in that dark cloud, but maybe it doesn't exist this time! I'd rather interested in the APO line of lenses if they are as good and small as the 50mm version. rick.lang wrote: Danny, after IBC 2015, I'll pass on feedback to SLR Magic about the need for 2x Anamorphot CINÉ in PL mount. It could still happen I suppose as other feedback I've received has also backed up what you're saying. I was just trying to find the silver lining in that dark cloud, but maybe it doesn't exist this time! Thanks Rick, it would be great if they came through with 3-5 lenses in a set of 2x anamorphic primes. Let's keep the hope and feedback alive. I am also seeing some growing support for the 1.33x S35/FF Anamorphot CINÉ lenses for those who see the benefit of utilizing their camera's sensors open gate without throwing away as many horizontal pixels as they might need to do shooting with 2x Anamorphot CINÉ lenses. We really need to see good footage to know what can be acceptable. I think if the 1.33x lenses go over well, then 2x lenses will follow as happened with the original SLR Magic Anamorphot adapters. I do like the relatively small size and reasonable weight of these 1.33x lenses. For those planning to shoot with screw-on ND filters, the 82mm filter thread is nice to see common to both the 2x MFT lenses and the 1.33x S35/FF PL mount lenses. Specifically looking at the current 1.33x S35/FF Anamorphot CINÉ focal lengths, I see the usefulness of the options currently available. Especially when used on the URSA Mini 4.6K PL open gate. The desqueezed wider horizontal angle of view on the full S35 sensor does provide the 35mm lens a moderate wide angle view which is well suited to most narrative work with an emphasis on the story rather than the anamorphic character. The 50mm is then a very normal looking lens again in terms of the expanded horizontal view. And the 70mm is a nice gradual step up for a longer focal length covering medium close to closeup shots depending upon camera placement and blocking. You can tell my bias leans toward a modestly wider angle of view using the full sensor rather than being dismissive of the lenses because they won't have full 2x character. You know, "when all you have are lemons, you make lemonade." In other words, you find how to make best use of the tools you have. rick.lang wrote: I am also seeing some growing support for the 1.33x S35/FF Anamorphot CINÉ lenses for those who see the benefit of utilizing their camera's sensors open gate without throwing away as many horizontal pixels as they might need to do shooting with 2x Anamorphot CINÉ lenses. We really need to see good footage to know what can be acceptable. I think if the 1.33x lenses go over well, then 2x lenses will follow as happened with the original SLR Magic Anamorphot adapters. Yes, of course the 1.33 will look great on the Ursa Mini 4.6K in 16:9 open gate. But I would like the oval bokeh, anamorphic geometry and lens flares. Perhaps the subject matter I'm shooting dictates that, and I am trying to avoid making things look too ordinary and mundane. Shooting a film in a relatively unexciting town, I'm looking to add any visual edge that I can. Of course, the content and story are important. That goes without saying. So while focused on the cinematography, looking at ways to get the most cinematic image out of this camera is my goal. This is a 4K clip I shot a year ago on the Panasonic GH4 and SLR Magic Anamorphot 1.33 on the Voigtlander f0.95 25mm taking lens. Both good-looking clips, Danny. The Concrete Night is certainly brimming full of dramatic tension and cinematic character. Glad to see the anamorphic look was subtle and not at all the 'story'. Your clip with the 1.33x lenses showed well controlled shots in which your angles and pacing give us time to think. I think whatever you decide and whatever you do is going to be fine. Danny, looks like SLR Magic is considering doing a 2x Anamorphot CINÉ set for PL mount based on a number of people at IBC 2015 requesting that product. That may lead to an announcement in 2016. I think it will happen, just a question of when it will happen. Interesting that the individual cost of the lenses is about $8,500 but if one orders a set of three lenses, the cost will be about $7,000 so that means you get the 35mm Anamorphot CINÉ Super 35 for about $1,000 if you plan on using the 50mm and 70mm FF lenses! rick.lang wrote: Danny, looks like SLR Magic is considering doing a 2x Anamorphot CINÉ set for PL mount based on a number of people at IBC 2015 requesting that product. That may lead to an announcement in 2016. I think it will happen, just a question of when it will happen. Hey Rick, thanks for the news. I had just read that link. I have a tentative March 2016 principal photography start date, so it looks like I won't be able to wait for the 2x PL's whenever they are released. I did find a good rate on Kowa Prominar 2x PL's for $5400 a month. My DP (and many other DP's) are lusting for the new Vantage miniHawks which are an amazing T1.5, but I'd imagine they will cost at least $500 per lens a day. On a 3 week shoot, that's $4500 per lens. And that's not taking into account the non-availability. Those Mini Hawks appear to be an adaptation of the Vantage T1.0 circular primes. Adding the 2x Anamorphic element(s) cuts the light roughly one stop. SLR Magic has posted that the 50mm APO prime will be available by November/December 2015.
rick.lang wrote: SLR Magic has posted that the 50mm APO prime will be available by November/December 2015. I really hope Andrew will be announcing the rest of the range soon. But if the lead time of this lens is any indication, I'd be surprised to see any extra lenses in the set available for purchase before 2017. I hope I'm wrong! Tristan, I'm confident a few other lenses will come along in 2016. Doing the first lens and already having it in production is most of the work as the first lens lays down a lot of the design and fabrication groundwork that won't be repeated with each lens. Well that makes sense. And considering the discussion Andrew was having with the forum/s around what features everyone wanted in the set, keeping the size constant was pretty high on the list. Maybe that may help streamline or speed up the manufacturing process? The APO are going to be kinda go big for a Pocket Camera? I got a few of the Veydra Mini Primes, they work very nicely with the BMPCC, and are a better fit I think. The APOs would be great with the Ursa and Ursa Mini, in addition to the 4K Production camera. Denny Smith wrote: The APO are going to be kinda go big for a Pocket Camera? I got a few of the Veydra Mini Primes, they work very nicely with the BMPCC, and are a better fit I think. The APOs would be great with the Ursa and Ursa Mini, in addition to the 4K Production camera. Yeah I was kinda thinking of the long term investment in the glass, for moving up to super 35 later. I've been looking at those Veydras, but the concern is they wouldn't be able to move up to super 35 later. They appear to be very sharp, how do you find them wide open? Which lenses do you have of theirs? Dwane, the Veydras are a very good solution at a reasonable price point if you are happy shooting on a MFT mount/sensor. But you're right that you may want to consider other lenses if you hope to have lenses that can work on larger sensors. I assume you still have time to discern which approach is best for you given it will be several months before you could have an APO lens set comparable to the Veydras. The APOs are a budget option that future-proofs you up to 'full frame' coverage. Dwane, unlike the Zeiss Super Speeds, the Veydra's are nice and sharp wide open, A little minor CA on the wider lenses at max f/stop, but that is gone stoping down 1-2 stops from wide open. They are very well made too, and should hold their value. So you could get the Veydra's today, and when you step up to a S35 format, either sell the Veydras to get the APOs, or just use them on the smaller sensor camera as a B Cam. That is what I do, I have by Cine Zeiss ZFs for large sensor work, and the Veydra's on my Pocket camera. Denny Smith wrote: Dwane, unlike the Zeiss Super Speeds, the Veydra's are nice and sharp wide open, A little minor CA on the wider lenses at max f/stop, but that is gone stoping down 1-2 stops from wide open. They are very well made too, and should hold their value. So you could get the Veydra's today, and when you step up to a S35 format, either sell the Veydras to get the APOs, or just use them on the smaller sensor camera as a B Cam. That is what I do, I have by Cine Zeiss ZFs for large sensor work, and the Veydra's on my Pocket camera. Yeah they're really tempting those Veydra's. They've got a lot going of them - small, compacts, consistent length T2.2 and 300 degree focus rotation. Do you have any footage of them online with your pocket that you've shot raw with? I can't seem to find many good examples of them. Sorry, no, most of my work is for clients, and lately, most of that has been ProRes. But I am working on a personal project to be shot in Raw, with ProRes backup files on the Video Assist. This project, is one of the reasons I got the a Pocket camera to begin with. The imp issue I have,had wither, and all MFT mount lenses on the Picket camera, has been the slight rotational play in the lens mount. But, this has now been eliminated with the new Veydra lens to rail lens bracket/clamp. I also have been using a clamping matte box to stabilize the lenses. Last edited by Paul Kapp on Tue Oct 03, 2017 6:25 am, edited 2 times in total. John, didn't provide any description about the APO lens. It may be the prototype or pre-production, but it could well be the first sighting of the production SLR Magic APO 50mm prime since that lens is in production now with a possible November release. If you click on the lens breathing test comment in his tweet comment, it takes you to his blog, were he commented, "I was lucky enough a few days ago to receive the brand new first production run of the SLR Magic 50mm T2.1 APO PL mount lens and I was keen to try it out on some skin tones.". John B.
Edit: My bad, that was from Jan 2015, I did not check,the dare, sorry. Last edited by Denny Smith on Tue Oct 20, 2015 7:54 pm, edited 1 time in total. Thanks, I'll do that. This is just great news since it looks like the 50mm APO and the Mini 4.6K are possibly both going to be released in November. Just in time for the traditionally worst weather in Victoria BC. I could use some collective prayers for a recovery of the stock market in Canada. Did I just say that!? I don't mean to sound selfish, but it would be pleasant to see good growth so I can use the growth to fund the purchase of camera and gear. Edit: the only link I saw in the comments referred to John Brawley's blog in January 2015, but that was a prototype. Maybe he has updated the text of that blog to refer to the production version now but didn't change the date of the original blog. I read that post in January. It hasn't changed. If his tweeted pics are new then he may well have a production model on his ursa. Last edited by Paul Kapp on Tue Oct 03, 2017 6:26 am, edited 1 time in total.